Our team of professionally qualified technicians provide a wide range of electrical services and accessory installations for your car. To use a well-worn cliche, there’s no job too big or too small. We can repair or overhaul your alternator or starter motor or provide you with a new one. We’re well versed in wiring, fuses, wipers, horns and electric windows. We can help with auto electrical and accessories for all vehicle makes and models. Alternators: The alternator provides electrical power while the car is running and it is also responsible for charging your battery. We can provide a new, repair or overhaul your original alternator or starter motor. General Wiring: Fuses, switches, relays, windscreen wiper systems, horn, electric windows – anything electrical we do it! Electric Brake Units: Have these fitted to ensure safe stopping while transporting your trailer, caravan or motor home. We offer a wide variety of electric brake control units. Dual Battery Systems: We can supply fit and wire a dual battery system to meet your needs for your caravan, auxiliary lighting and fridges. 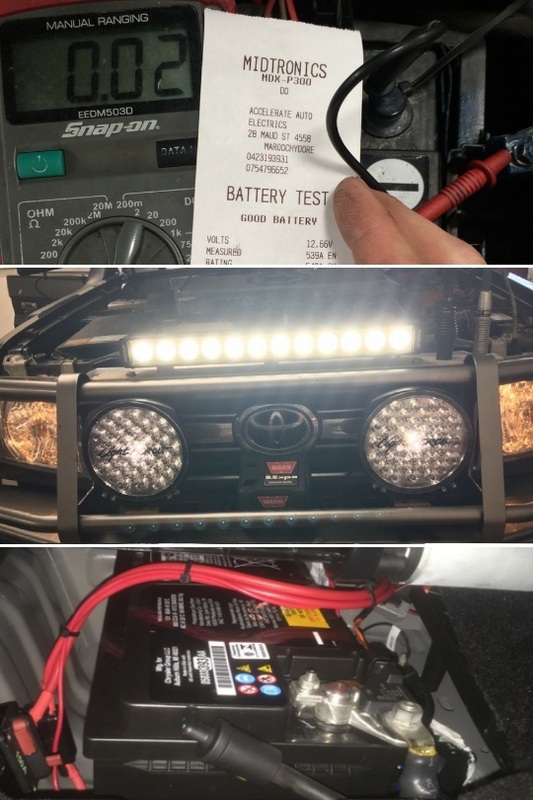 Lighting: We offer a wide range of auxiliary lighting including spot lights, driving lights, rotating and flashing lights, LED work lights and auxiliary lighting for your car, truck or machinery. With a wide range of stocked products, we will get you set up with the right gear. Specialists in Engine Systems: We can help with all engine management systems for all vehicle makes and models.